As per tradition, Steve and I spent a long weekend in Germany for our anniversary back in December. The city of choice this time was Cologne and the Christmas markets were the best I've seen. There was plenty to keep us busy for 3 days from museums, a day trip to Düsseldorf and of course world renowned Christmas festivities around every corner throughout the city. 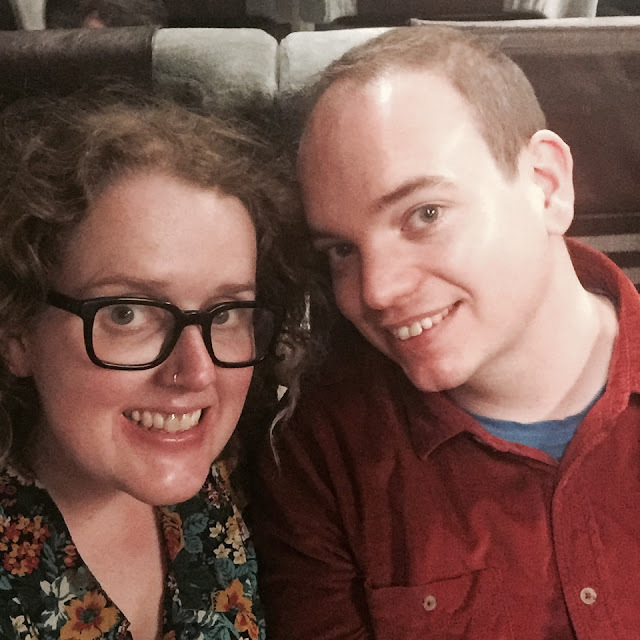 We caught the Eurostar to Cologne, changing in Brussels and arriving late on a Thursday night. With our train home booked for Sunday evening 3 full days was the perfect amount of time to spend in the city. Especially as it meant we had one full day to explore Düsseldorf which is only a 30 minute train ride away. I booked our accommodation only a month or two before our visit which meant there weren't many places available unless I was willing to fork out hundreds of Euro a night (which I wasn't). Fortunately I came across Bermuda Triangle Bed and Breakfast which is a lovely little apartment costing €224 for 3 nights which for a weekend near Christmas is a really excellent deal. The apartment is in an excellent location (Neumarkt), only a 15 minute walk from the centre of town (or a couple of stops on the metro) we were literally around the corner from a beautiful market and down the road from plenty of fantastic bars and restaurants. We arrived in the city super late but not wanting to waste a minute we headed out to visit the local Christmas markets (they were already closing by 10pm) and have a few drinks at the local bars; Salon Schmitz, Bar Schmitz and Sixpack. On our first morning we spent a little time walking around our local area and checking out some of the fabulous architecture Cologne has to offer. We stuck our heads into the Rautenstrauch-Joest and Schnütgen museums that share the same building. Whilst we didn't look around either we did spend a minute or two in the impressive entrance hall marvelling at the glass topped, ultra high ceilings. We spent about an hour in NS-Dokumentationszentrum der Stadt Köln which is a museum focusing on the Nazi and Soviet rule in the city. There is an awful lot to take in and the prison in the basement is a rather harrowing experiencing but if you're interested in 20th Century European history then it's definitely worth a visit. We walked past Kölnisches Stadtmuseum, appreciating the exterior façade but didn't go in. Our next stop was the famous Cologne Cathedral (Kölner Dom) and what a magnificent site it was in all it's gothic splendour. There's a lovely Christmas market next to the Cathedral. We grabbed a potato pancake with apple sauce and listened to German Christmas carols. Next on our list was Cologne's premier contemporary art gallery, Museum Ludwig where we caught the Joan Mitchell retrospective. The permanent collection is pretty wonderful as well. Having not actually eaten that much all day we dropped into Peters Brauhaus, one of Cologne's most famous beer halls for some hearty German food. The pork knuckle was ridiculously huge but if you like meat and potatoes this is definitely the place for you. The locally made beer (kolsch) is pretty decent as well and that's coming from someone who doesn't really like beer. Night had begun to set in so we checked out another Christmas market, this one was next to the city hall and was one of my favourites (Alter Markt). Even though it was rammed full of people the twinkling fairy lights, sweet smell of gluhwein and chestnuts, and festive cheer all around made it an absolutely magical places and definitely one of my favourite markets in the city. That evening we headed into the Cologne suburbs to catch El Vy play at Die Kantine. Great band in a great venue, just a shame it was such a faff to get to. Our second day started with brunch at Bastians who put on an absolutely fantastic spread. We then headed to the train station for our day trip to Düsseldorf. Trains are frequent and fast, ours took less than half an hour and costs about €12 each way. We spent an hour of two checking out the contemporary art galleries K20, Kunstsammlung Nordrhein-Westfalen and Kunsthalle Düsseldorf. K20 had a pretty great Agnes Martin retrospective whilst Kunsthalle was in between exhibitions so there wasn't too much to see. After a morning of culture we headed to a Christmas market. Perhaps because it was the middle of the day but it didn't feel as special as Cologne. We walked along the river until we reached the TV Tower which offered wonderful views across the city. Once we were back in town we stopped at Zum Schiffchen, a beer hall, for food but I forgot to take a picture. We stopped for a beer a Düsseldorf's number one beer hall, Uerige Obergärige Hausbrauerei, for a local altbier. As you can see it's a lot darker than the beer in Cologne and in my opinion not as nice. As darkness set in we wandered around the Christmas markets, eating waffles and enjoy the festivities. We even found a cupcake shop to stock up on treats for the train journey back to Cologne. Back in Cologne we walked through the Christmas market next to the station and cathedral that we'd already visited during the previous day. Come night time it is a totally different experience and the fairy lights form a canopy under the dark sky and you feel like you're in a magical land. Here's a picture of me being cute with some gluhwein in my Blur Christmas jumper. We'd eaten at really random times that day so we sough out Bei Oma Kleinmann, a restaurant famous for their many different schnitzels late that evening. I'm glad we decided to share one because they are absolutely enormous! En route we also stopped at Brauerei Päffgen, another famous beer hall in Cologne. We had breakfast in Metzgerei Schmitz for our third and final day in Cologne. I'd been wanting to come to this deli all weekend so it was worth the wait. Steve loves football so of course we had to check out the Deutsches Sport and Olympia Museum which was actually really interesting. I enjoyed all the Adidas sports wear on display and the Olympic sections were definitely insightful. We walked along the river and made it back into the town centre where we finally visited Museum für Angewandte Kunst i.e. Cologne's design museum. I'm so glad we sought out this place because the post modernism exhibition was fantastic. We collected our bags from the apartment and checked out our local Christmas market one last time where we picked up a delicious currywurst before catching the train home. We actually tried to get crepes from Engelbät but the queue was too long. Cologne was lovely, especially the Christmas markets and for a fairly small city there's an awful lot to do including some excellent museums. I don't feel the need to visit again but I'm so glad I did over the Christmas period as the markets really were magical. Düsseldorf was lovely as well but a day to visit is definitely enough, I saw everything I wanted to so I'm glad we visited from Cologne. Getting the Eurostar to Cologne is super easy, even with the change in Brussels. The train station is slap bang in the middle of town right next to the Cathedral and with an easy to navigate metro and tram service it's really simple to get around. I am beyond excited to go to Cologne next month now!